Recent work by Marlene McChesney ranges from floral still lifes to pictures of wild Mustangs to photographs of working ranch life - on ranches in New Mexico and at her family's custom cattle operation near Gladstone. An exhibition of McChesney's photographs opens at the Art Guild Sunday, June 8, with a reception at 2:00 pm. Hosts are Debbie Bessine, Chuck and Ellen Fuller, Burlington, and Shirley Gullberg of Stronghurst. 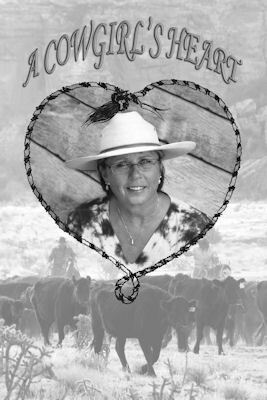 Horses and cattle own Marlene McChesney's heart, a cowgirl's heart. They were passions inherited from her grandfather, Dale. He was known as "Cowboy," and although he died three years before she was born, she always felt the connection. Five years ago she picked up her first camera and began to capture those feelings she'd been handed. As herdsman for her family's cattle operation near Gladstone, she preferred to ride the herd with two cowboys, refusing to use the four-wheelers most modern ranchers had turned to. Those first photographs of the mythic tango of man and horse earned her a coveted spot in a juried show in Las Vegas during the National Finals Rodeo, a highlight for any Western artist. She'd ride with a camera around her neck, capturing the action on the family ranch. But she wanted to reach out, back to her past, back to Cowboy, the grandfather who had left her with dreams, a set of yellow tin dishes, and a treasured Indian blanket. Family stories led her to Raton, New Mexico, where Cowboy had traveled to buy cattle for the Gladstone farm. Someone in town directed her to Miss Alice Moore, the now 70-year-old owner of Moore Ranch, who, as it turns out, had helped drive Cowboy's steers to the stockyard to be shipped east when she was 16. Moore welcomed McChesney with hospitality and with stories about her grandfather. "Miss Alice," also directed her down the road to the 230,000-acre T.O. Ranch, one of a handful of ranches still run on horseback. Camera in hand, McChesney gained the respect of the Moore and T.O. cowhands, the Raton locals, and, most importantly, "Miss Alice". After many return trips, she had enough photographs for her first Midwest show in four years, at the Art Guild of Burlington, Iowa. Most prominent is Ms. McChesney's passion for her subjects and for communicating an almost mystical relationship between cowhand and cow, between horse and rider, between present and past. Attend her reception Sunday, listen to her comments and her story, and enjoy her work. The event is free and open to the public.